I really debated as to whether or not to post this recipe, but over the years I've had so many requests for it that I finally decided I had to just let go and do it. Not that it's not delicious - it is most definitely that, sweet (but not too sweet) and light as a cloud with a pleasant lemony tang. And not that it's not beautiful - trifles just look so pretty, standing tall in their bowl with their lovely layers just begging you to dig deeper. And it's not that I want to keep it to myself - I love sharing my kitchen adventures with the world, or I wouldn't have started this blog ! No, my problem with this recipe is just that I'm a little embarrassed by it. One of the reasons the lemon was so great in my first versions of this recipe (other than the fact that I love lemon desserts) is that masks the aftertaste you can get from sugar-free products - the tartness really overrides the bitterness. So if going low or no sugar is your thing, use sugar-free versions of some or all the components...Jello, yogurt, and Cool Whip all come in sugar-free versions, of course, and you can even get sugar-free cookies or angel food cake. Just bring the sugar down to whatever level you feel comfortable with. Made with regular versions of all the products, though, this really is a gorgeous, light dessert that everyone is always happy to see...it can travel to any party with ease. 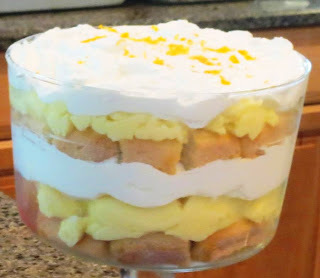 Oh, and if you don't have a trifle bowl use a large glass bowl or even a glass baking dish...simple trifle bowls are cheap, though, and you'll find them useful for all sorts of things. NEXT DAY - build your trifle. Start with a layer of ladyfingers; cover the bottom of your bowl, and sprinkle with the Limoncello or Meyer lemon juice if using. Spoon half the pineapple over the cookies (use a slotted spoon if you have already moistened the cookies with something else; otherwise use some of the juice in there too). Repeat all layers, ending with Cool Whip. Zest the lemon over the top.